site we feel it our duty to reward your efforts with workmanship that is extraordinary. in the home movie film to DVD transfer business. We've been doing film to DVD conversions longer than most any other company. We handle all movie film formats including 8mm, Super-8, 16mm, and 35mm. We transfer to all video formats up to and including uncompressed 10-bit 4:2:2 SD. After all, these are your family's home movies! years, why would you want to trust them to a film transfer lab with less experience than us? service with everything they need to know to decide to do business with us or not. All the questions you may have will probably be answered by what you will find here. But, if you still have others we insist that you call us. P.S. We're as close to you as your local UPS Store or US Post Office. Question: I need to get my films in some kind of order before I have them transferred. Is it OK to run them on my projector? Answer: We do not recommend using your old projector to run your home movies, for several reasons. If the projector has not been used in many years, it may not be in proper operating condition. The rubber drives may be worn, the belts cracked, the heat shield broken, etc. You run the risk of permanently damaging your film. Also, projector bulbs are very expensive and hard to find these days and the old style lamps only lasted a few hours. You may go through several bulbs just trying to view your old movies. The preferred method and the safest, by far, is to use a film editor or viewer to look at your reels. Since the editor has to be cranked by hand and uses a very low wattage lamp there is no possibility of tearing or burning the film. If you are local to our area and do not have an editor of your own, we have them for loan! Just call us to reserve one for the week. A roll of 16mm movie film from 1930! will look as good as the day they were shot! Question: I've seen these "transfer boxes" in department stores. Can I use one of these and do the film to DVD transfers myself? Answer: Yes, if you have a projector that is still running well and you're certain it will not eat or burn up your precious home movie film you can try to use such a device to convert your home movies. A couple of things to keep in mind, however. The "transfer box" is really nothing more than a frosted screen and a mirror. You are simply doing what is called a rear-projection onto the back of this frosted screen. The mirror is used only to reverse the image, left to right. The box does nothing to eliminate the flicker you will get from your projector and nothing to eliminate the hot spot you will see in the center of the picture. Since there is that frosted screen between your movie film and video camera you will lose a great deal of image resolution. Remember, you are actually focusing on the frosted screen...not on the film image itself. There will be no contrast to the picture to speak of and you should expect to be able to see the screen pattern (along with any dirt or dust or scratches) in your final transfer. Of course, you will have no control over changes in exposure (density) as the scenes shift from light to dark. 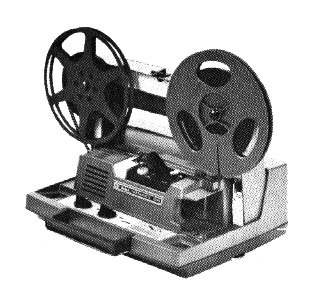 As horrible as all this sounds, there are many so-called "professional" transfer firms that use this very device to convert home movies to videocassette! 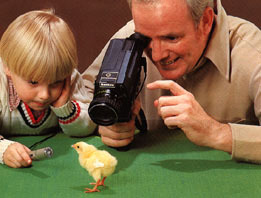 Question: How do you transfer home movies to video? 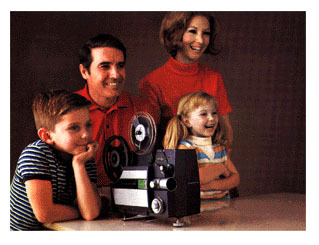 Answer: We use an industry-standard system called a "telecine" to properly convert your home movies to DVD or digital. 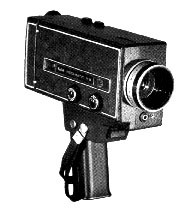 The system is composed of a TK-28B telecine camera and multiplexor made by RCA, of New Jersey. Specially modified telecine projectors... one for each format... are optically aligned with the field lens of the unit. 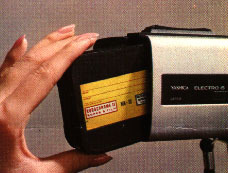 The TK-28B uses an aerial-image process to convert film to video. That is, the film image is actually focused in air...there is no screen to separate the telecine camera from the movie film. The result is maximum clarity and contrast. The TK-28B stands six feet tall and weighs over 1500 pounds. It has only one purpose in life... to convert a film image into video image! Question: How does this telecine operate? Answer: The TK-28B is a "three-pickup" telecine. This means it separates the film's picture into its Red, Green and Blue elements before scanning and processing the signal. Primary color separation allows the system to provide highly accurate, deeply saturated colors. The TK-28B is equipped with automatic color balance, automatic black balance, automatic gamma (grey scale) balance and automatic light level control. This may not mean much to you right now, but it will if you have your film to digital transfers done on equipment that does not have these capabilities. Question: How will my movie films look when transferred to DVD. Answer: The TK-28B has several special features that enable us to give you the very best transfers possible. The first is the ability to precisely monitor and correct for any changes in the peak light level of the picture over a range of five "F" stops (500%). This allows the system to pump a tremendous amount of light through your film to bring out those dark, underexposed scenes everybody has. If you were able to see the image on your movie screen you will see it in your video! The second feature of the TK-28B is a device called ChromaComp. ChromaComp allows the telecine operator to precisely tailor the color variables of the system to the particular film stock being transferred. Our ChromaComp has been calibrated for Kodachrome film, by far the rest popular home movie film ever used. This allows us to give you a color picture that matches your movie film frame for frame. Skin tones will be perfect, reds will be the reddest, blues the bluest and so forth. Your films should retain the same clarity in the video transfer as you were used to seeing on your movie screen. Question: Explain about the difference in film speeds? 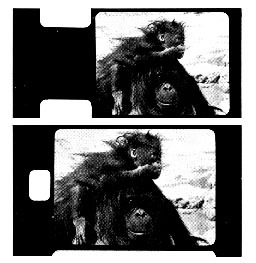 Answer: Old 16mm and 8mm home movie film was originally shot at between 15 and 16 frames per second (FPS). 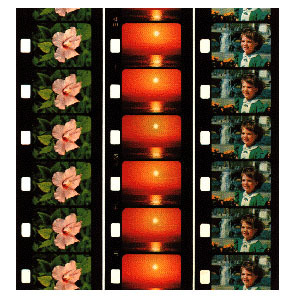 When Super-8 was introduced in 1965, the speed was adjusted up to approximately 18 FPS. Many transfer houses run their orders at 20 FPS causing the picture to appear much faster in speed than originally filmed. We use specially modified telecine projectors that are carefully calibrated to produce the most natural-looking home movie transfers. Question: How do you care for my movie film? 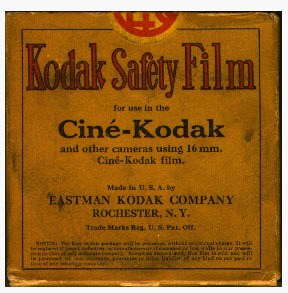 Answer: The average home movie film we handle is from the 1950's. Is is already over 40 years old. Your movie film is of paramount importance to us. Every foot of your film is inspected and repaired as necessary. Your small reels will be loaded onto larger reels to give you an uninterrupted transfer. All unexposed or clear sections will be removed, as well. Finally, your film is treated with the only solvent ever made to safely and thoroughly clean movie film to remove surface dirt, fungus and finger oils before it is transferred. Question: Why do you charge by 1/4 hour increments and not by the foot? Answer: Our transfer services are all-inclusive. That is, we do not charge separately for the preparation time required to assemble, load, splice, repair, and clean your film before it can be transferred*. All of the labor and the supplies necessary (the movie reels, the film leader, our special anti-static and anti-fungal film cleaning fluid. the lint free cleaning pads, repair patches, etc.) are included in the transfer charge. For this reason we feel the fairest way to charge for our work is by the final total running time of your transfer order, rounded up to the next 1/4 hour. *Please note, these extra fees can be a significant part of your total bill if the transfer house charges for them! Question: What about getting copies of my transfer? Answer: The transfer process converts the movie film image into an mpeg2 digital file which is then sent on to one of our servers. After all the film is converted to digital, the various reel segments are edited and combined into a final, fully authored DVD. This becomes your film transfer master. It should be stored with the film for safe keeping. Therefore, it is advisble to have at least one duplicate DVD(s) made from the master for playing and sharing with family. We can provide inexpensive DVD duplicates of your movie transfers from the master DVD. When making duplicates from digital originals like DVD's there is no generational loss. All duplicates will be exaactly the same as the master. This web site is Copyright © 2006 - 2019 TFG Film & Tape, All Rights Reserved. This site or any of its contents may not be copied or mirrored on any other web site or used in any document, printed or electronic, without the express permission of this site's owner. If you find certain wording or phraseology used above to explain our work or services on other web sites please know it has been pilfered from us and is a clear violation of our copyright.